This month, The Cook Book Guru is featuring Claudia Roden’s A New Book of Middle Eastern Food. I have already posted two recipes from this cookbook, Moroccan Tagine with Prunes and Muhallabia (one of my all-time favourite desserts). As I have previously mentioned, Claudia’s book is the classic English language cookbook on Middle Eastern cooking. It was first published as A Book of Middle Eastern Food in 1968. Spanakopitta, Greek spinach and cheese pie, is a world wide favourite vegetarian dish… and for good reason. It is yummy. Claudia offers two versions in her book, neither of which totally appealed to me. The first recipe was made with filo pastry but the filling was, literally, spinach (cooked in butter and a little salt) and cheese which sounded a bit too basic. The second recipe’s filling was very similar to a recipe I use for spinach triangles but was made with puff pastry rather than filo. I decided to combine the two. I used the filling from the second recipe with filo pastry. I also halved the filling. Another modification was the amount of cheese used. When halved, Claudia’s recipe called for 125g of feta or 125g of cottage cheese. I put in 125g of feta in my bowl and it didn’t look enough so I checked my usual recipe and noted it calls for 125g of feta and 125g of ricotta. As I had 125g of ricotta in the fridge, I used that. These quantities make a 22cm square pie which will serve 4 people. The pie was perfect for a light luncheon. *This is a 15mil tablespoon. Fry the onion and spring onions gently in a little oil until soft and transparent – about 10 minutes. Do not brown. If need be, add a little water to stop them sticking. If using frozen spinach: defrost the spinach then put it in a sieve and squeeze out the excess fluid. Add the drained spinach and dill to the pan and cook until the mixture is quite dry. If using fresh spinach: Add the spinach and dill to the pan. Cook until the spinach is completely wilted. Drain off excess moisture. Set the spinach mixture aside to cool. When cool, add the cheese and the eggs. Season with black pepper, salt (if necessary) and nutmeg. Butter a 22cm square baking pan. Lay five sheets of pastry in dish, alternating the long and short sides so that the sides of the pan are also covered. Brush each sheet with melted butter as you place it in the pan. Leave the overhang. Spread the spinach and cheese mixture into the pan. Cover mixture with the remaining five sheets of pastry, brushing each layer with melted butter. Again, alternate the long and short sides and leave the overhang. If you wish, you can crunch up the final layer of pastry to get the effect I have in the photo. Cut overhanging pastry to leave about 5cm. Roll up overhang to form edge of pie. Butter final pie. Preheat oven to 150°C and bake for about 45 minutes. Increase the temperature to 200°C and cook for 5-10 minutes until the top is golden brown. This entry was posted in Eating your bounty, Pies and tarts, Spinach, Silverbeet etc, Vegetarian, What's for dinner? and tagged Claudia Roden, Spinach pie, The Cookbook Guru, What to do with excess silverbeet, What to do with silverbeet by Glenda. Bookmark the permalink. Yum, this was on our menu just last night, pretty much exactly how I make it, only we use feta only not 50/50 with ricotta. I add a bit of dried mint too, give a bit of freshness. Hi Lisa. It is such a fab dish, I think it is everyone’s favourite. Love spanakopita, Glenda. I visited a few of the Greek Islands and tried each one’s version — repeatedly. I considered it research. I’ve only used feta when I’ve made mine. Next time, I’ll give your filling a go. I’m sure it will be fantastic. Hi John, that is my type of research … it is funny, most say they use both feta and ricotta, though the original recipe was for just feta or cottage. I think all you be yummy. A great recipe. I always add lots more dill ( like Deb) and some mint, and other herbs on hand. I always use half ricotta and half fetta. I tend to use silver beet ( chard) as I have so much growing. My Greek neighbour, Anna, layers the filling between the filo sheets, which makes an interesting variation. She usually does this with Tiropita, the cheese version of the dish. That Tiropita sounds wonderful Francesca. I used silverbeet as I having coming out of my ears, normally I would use frozen spinach. 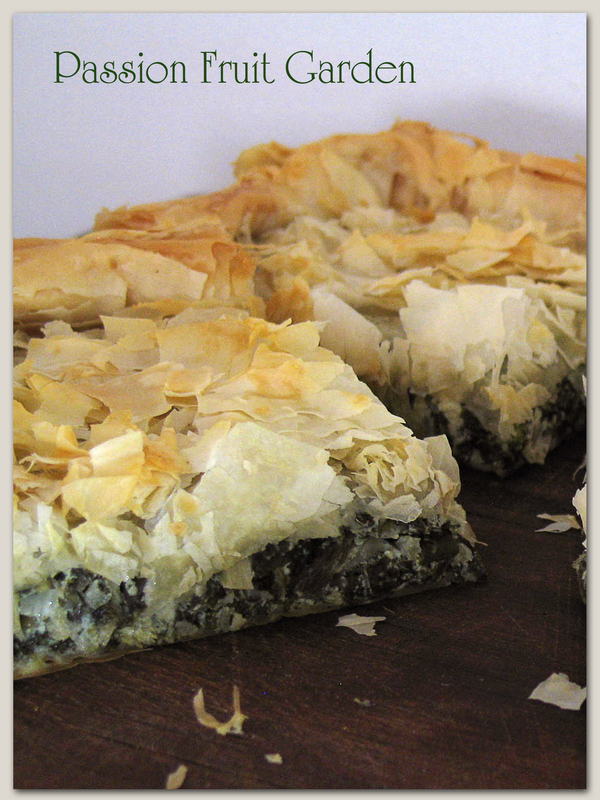 Glenda has contributed a beautiful Greek dish of Spanikopita for this month’s Cookbook Guru. It just goes to show how versatile Claudia Roden’s Book of Middle Eastern Food is. If you haven’t already checked it out, then I highly recommend getting your hands on a copy asap! For now here is a gorgeous contribution for a meat free Good Friday. Glenda, perfect timing with this recipe… my spinach is flourishing and I bought some phyllo with the intention of trying spanokpita. Happy Easter. Hi Liz – it is such a wonderful dish I should make it more often. It is just that there are so many things to make. Hi Sandra, I am not such a fan of spinach that I could do without the cheese. One needs a bit of decadence. Mum loves when I make this. She knows she’s going to get a few pieces for dinner. I add some sliced spring onion to mine and use both ricotta and feta. I think I’ve got dinner organized for one night next week. Hi Lona, you know I haven’t made Spanakopitta for ages. We used to make it all the time in the late 70’s. Sounds like your recipe is similar to what I usually use to make my spinach triangles. Hi Celia, Thank you for lunch. Don’t forget you are always welcome here. Lookout for a cheap fare and come over for a few days. You will be most welcome. We could show you the sights of B’town. Would you believe it Celia? I am nearly out of the bloody stuff!! I thought it would never end. Very nice Glenda. I never knew it had such an interesting name – always called it spinach pie myself. I agree with you there – Roden’s spanakopita recipe is a bit too basic. Like my Greek friends I often sauté a leek in addition to the onion and add much more dill. I also (as you have done) I use half ricotta and half feta which cuts the saltiness – something sanctioned by those Greek friends. A great recipe!